I live in New Mexico and for the most part, the sun is always shinning during the day. I also love to go for walks everyday. I love the sunshine when I am out walking but it can do damage to my skin as the effects of skin exposure to the sun’s rays, even for a short amount of time every day, can create early lines and wrinkles, cause sunburn, decrease the skin’s natural moisture levels, mark up the skin with unsightly dark spots and even be the cause of cancerous lesions. I want to keep my skin looking nice so I protected it with a good sunscreen. 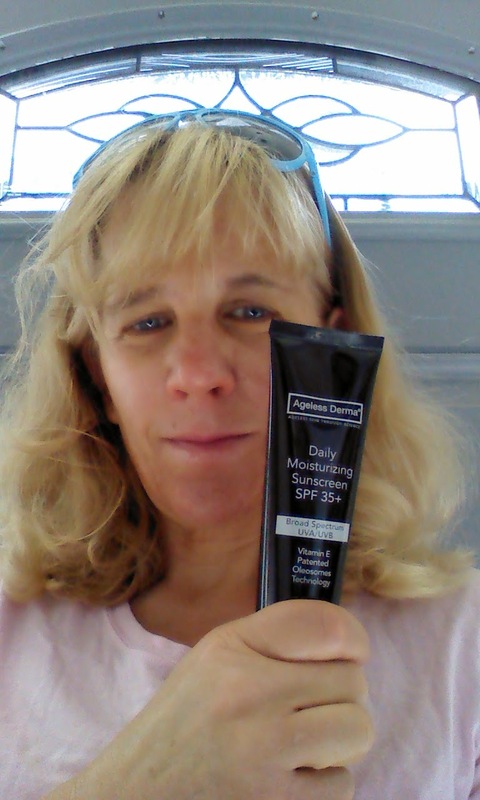 I love using Ageless Derma Daily Moisturizing Sunscreen SPF 35+ on my skin as it not only protects my skin from the sun’s potentially dangerous rays, but it also provides deep moisturizing benefits that are absolutely necessary after experiencing solar exposure. So what makes Ageless Derma Daily Moisturizing Sunscreen SPF 35+ so special? Ageless sunscreen utilizes a Safflower Oleosomes technology system to deliver broad-spectrum protection from ultraviolet (both UVA and UVB) sun exposure. This unique patented delivery system allows for maximum penetration of the moisturizing sunscreen, giving the user the most reliable and powerful sun protection combined with the highest levels of hydration. Oleosomes are natural, botanical oils found in certain plants and seeds. These oils provide plants with a source of energy and thereby allow the sunscreen element in Daily Moisturizing Sunscreen SPF 35+ an active delivery system and a stable environment for the effective ingredients contained within this double-duty moisturizing sunscreen. The Safflower Oleosomes also allow for less emulsifying chemical agents to be used, a necessary formulaic ingredient but one that can potentially interfere with the sunscreen’s activation process. The Oleosome in Daily Moisturizing Sunscreen SPF 35+ enables the SPF, which is already more than 35, to become more intense and at the same time non-irritating to skin. The oleosomes in Ageless Derma Daily Moisturizing Sunscreen SPF 35+ are time-released to deliver maximum sun protection over a period of time. As a result of the least amount of emulsifying chemicals needed for more than adequate sun protection, the skin is both protected from the sun’s UVA and UVB rays as it adds moisture. 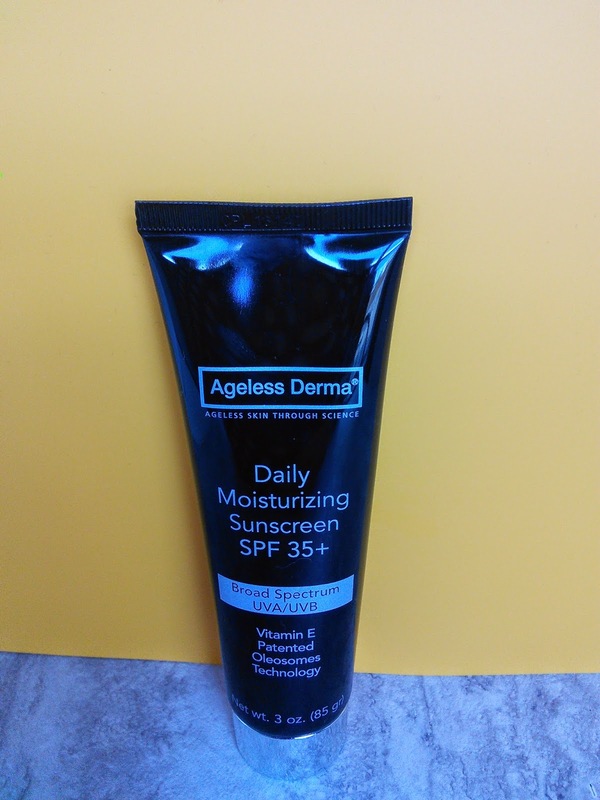 So I am going to use Ageless Derma Daily Moisturizing Sunscreen SPF 35+ before I greet the sun and protect my skin from the damaging effects of the sun and prevent premature aging and skin cancer. 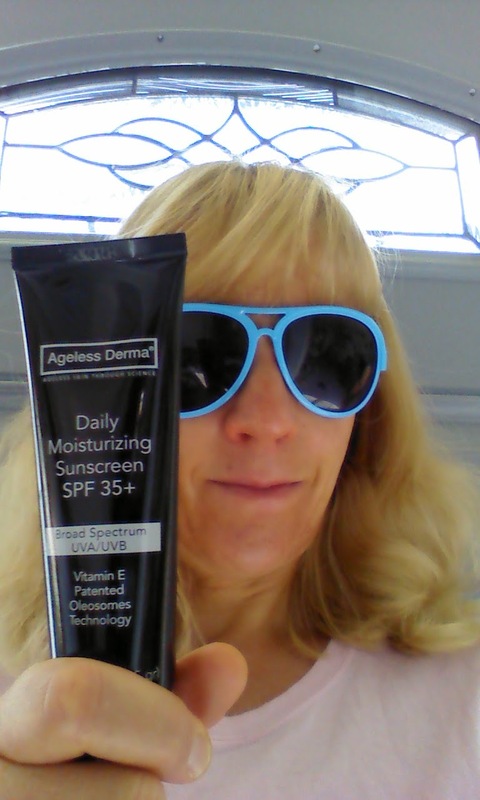 I have a tube of Ageless Derma Daily Moisturizing Sunscreen SPF 35+ to giveaway to one of my readers. Just enter on the Rafflecopter form below and good luck! "These opinions are my own and I received the above mentioned product to facilitate this giveaway." I would want to try the Ageless Derma BB Cream Tinted Moisturizer Light 1.35oz. I'd love to try the Ageless Derma Age-Defying Lift and Bright Eye Gel .5oz to help with my wrinkles! I like the Ageless Derma Good to Go Mineral Makeup Starter Kit Medium. I also like their Serum Moisturizer. I'd want to try the Ageless Derma Anti-Aging Intensive Skin Brightener. I would love to try the Ageless Derma Retinol and Vit K Eye Cream. I like Ageless Derma Age-Defying Lift and Bright Eye Gel. I'd love to try their lipstick in cherry bomb. I would love to try their mineral makeup! What an awesome selection! I really want this moisturizer. I need to use one and I love that it has an SPF of 35. Love me a good moisturizer with sunscreen! Our skin needs that protection. Seems like a great product, I'm always looking for new skincare that works. The Ageless Derma BB Cream Tinted Moisturizer Light would be perfect for my fair skin! Hello my friend! I would like to tell you that this write-up is awesome, great written and include almost all important info. I recently came to know about https://avanaaustralia.com.au/, their Mineral Makeup are very effective.